Recorded Live at Hampden Park, Glasgow, Scotland - August 25, 2006. Excellent Soundboard / Stereo FM Recording :: Bootleg Silver CD :: CBR 320 kbps & FLAC. 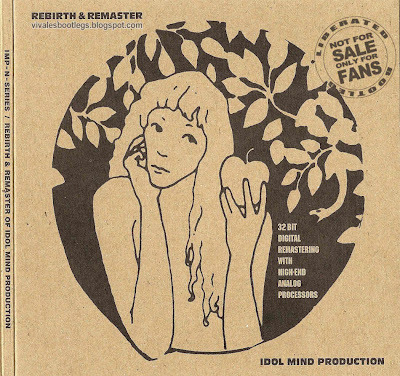 Files: 30. :: Size: 256.37 MB (mp3) / 835 MB (flac). Personnel: Mick Jagger :: Keith Richards :: Charlie Watts :: Ronnie Wood . Notes: 32 BIT digital remastering with high end Analog Processors. This IMP release sounds better than most (or maybe ALL[?] 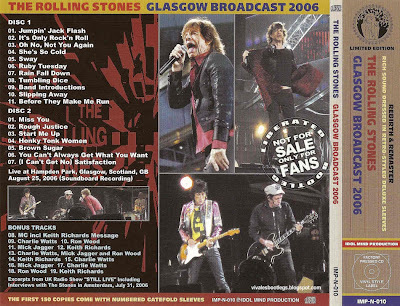 ) Glasgow 2006 bootleg-releases. Don't ask me why.....but it does. Note that this FM broadcast is missing 2 songs: "Live With Me" and "Sympathy For The Devil". No wonder they didn't broadcast those 2 ones.....lotsa mistakes did occour during them songs. Enjoy. Erik_Snow.<-(Info taken from original nfo file).